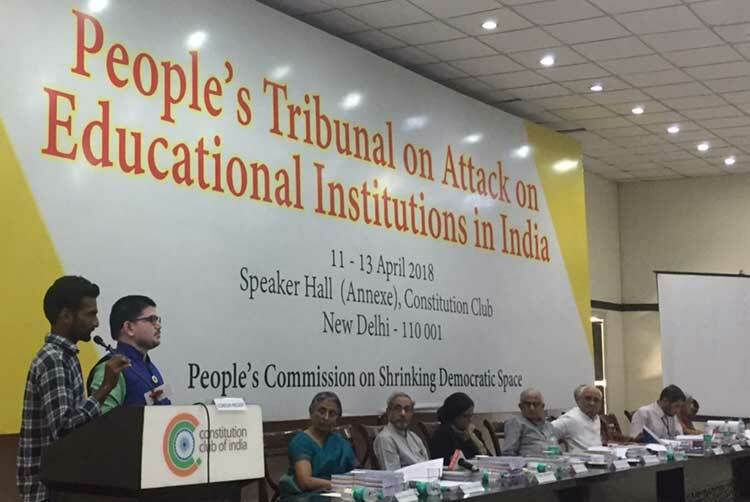 People’s Tribunal on Attack on Educational Institutions was held at the Constitution Club of India, New Delhi, on April 11-13, 2018. The tribunal was organised by the People’s Commission on Shrinking Democratic Space in India (PCSDS). The jury panel of the tribunal comprisedJustice (Retd.) Hosbet Suresh, Justice (Retd.) B.G. Kolse Patil, Prof. Amit Bhaduri, Dr. Uma Chakravarty, Prof. T.K. Oommen, Prof. Vasanthi Devi, Prof. Ghanshyam Shah, Prof. Meher Engineer, Prof. Kalpana Kannabiran and Ms. Pamela Philipose. Prof. Romila Thapar was the Chair of the plenary session of the tribunal. 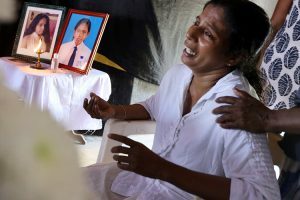 Testimonies of 120 students and teachers from close to 50 institutions and universities spread across 17 states were considered by the jury panel;49 testimonies were deposed orally at the tribunal. Along with these testimonies, there were 17 expert submissions on all thematic issues. The centrality of higher education to the survival of Indian democracy, was the theme of the two and a half days of the Tribunal. This why the higher education system must itself be the space where the freedom to think, explore, discuss, and also to dissent, is maximised.Higher education institutions must be open to all sections of society, particularly those marginalised in multiple ways. Ample evidence of the significant deepening of the crisis over the last four years was provided. Alarm bells are ringing loud and clear. Retrieving and rejuvenating the higher education to conform to our constitutional values must be the nation’s top priority. We have observed through depositions made by students, teachers and experts that there is a systematic onslaught on the very idea of higher education in India. The recent decision by the Ministry of Human Resource and Development to grant autonomy to public institutions is an example of how the state is seeking to ensure that students from poor and backward communities are driven to the periphery and denied access to equal, quality and affordable education. In the name of autonomy, vocationalised and market friendly courses are now being promoted. Consequently, we found that across the country, institutions that once had good representation of SC, ST and OBC students are now in danger of losing their presence,precisely because these institutions have introduced fee structures that are completely unaffordable. We found that students are in a state of desperation. The diversityof representation of students in some of these prestigious institutions are in danger of being undermined by unaffordable fee structures introduced during the recent past. Along with this are certain entrance models imposed by the Centre that have worked against the interests of local students. A case in point here is that of a brilliant dalit student, Anita from rural Tamil Nadu, who was very keen on studying medicine but couldn’t because of the new model of entrance test called NEET. Entrance exams like this is a deliberate attempt to homogenise access to higher education that disproportionallyand negatively impacts SC, ST and OBC students. This is also an attempt to undermine the federal structure. She filed a case in the Supreme Court but lost all hope, her heart and committed suicide when she lost the case. Structural adjustments in higher education has had many negative impacts on students and teachers. The rising ad hocism of teaching staff has created uncertainty among the teachers and undermined critical thinking of both staff and students. For example, since the mid 80s there have been very few permanent appointments in the universities in Madhya Pradesh and the University of Delhi is believed to have 5000 vacancies at present. This has severely impacted the quality of education and the capacity for questioning. Ironically, when the state had a lower growth rate it was spending more on education.Today the government is abdicating its constitutional responsibility in funding education. Today we are witnessing not only the privatisation of higher education but also its corporatisation. This has impacted directly on country’s literacy level which is stagnating at 75%. In the process, state universities have been reduced to examination boards. We have noted that along with this privatisation, there has been a rise of socio-cultural conservatism. Local cultural resources have been appropriated by the Hindutva forces in order to buttress their own presence in local educational institutions. For instance in Assam, there are 500 RSS controlled schools under the name of Shankar Debo Shishu Niketan – 1.6 lakh students are accessing these institutions. The secular philosophy of Shankar Debo has in this way been taken over to project the Hindutva ideology. What we are witnessing is an increasingly homogenous and conformist academic culture. While essays such as Ramanujan’s 300 Ramayanas have been knocked out of the syllabus, the Sanskrit department of the Delhi University is said to be undertaking a “thorough” study of history to prove that Aryans were indigenous to India. We were told that RSS’s eight point guide to education is now providing the programmatic framework for these shifts. This is impacting both students and staff. An example cited from one of the prominent universities of Uttar Pradesh where teachers who had no academic qualification have been appointed to positions of authority on the basis of their affiliations with Hindutva outfits. What has been extensively documented is that any dissent or opposition to such efforts to distort history has led to severe crackdowns on students and teachers, a trend that has been accentuated since this government came to power. The ABVP has been privileged in many ways within the universities. For instance, in one case in Bihar these students were the only ones who have “acquired” 75% attendance showing how they are privileged in order to disempower other students. There has been systematic restrictions on student elections and all efforts to form student unions in many states. From the testimonies given, it became clear that suppression of dissent has taken various forms like legal action, disciplinary action, coercion within the universities against students and teachers on the basis of their dissent. This has often taken the form of denial and diversion of entitled funds to targeted students, teachers and departments. This is done with the deliberate intention by the authorities to create an atmosphere of fear and terror within the academic community. In many cases, with unprecedented presence of police and intelligence are particularly targeting vulnerable students especially Muslims, dalits, women and people from marginalised communities. By placing like-minded people in high posts in the administration, the authorities are being enabled to execute the commands of the government, to attack dissenting students and professors. The academic community has been subjected not only to physical brutalities and humiliating discriminatory comments, but also to extensive surveillance, inside and outside the campus. The criminal justice system is being used against students and teachers, the fundamental rights and freedoms guaranteed by the Constitution are being systematically violated and any kind of non-conformity is being criminalised under the guise of one version of nationalism. Labels like“anti-nationals”, “terrorists”, “deshdrohi”, “enemies of the state” are freely used to intimidate students and teachers. We have observed that there has been intensification of structural marginalisation of students and teachers belonging to dalit, tribal, religious minorities, north eastern states, Kashmir and gender based discrimination,including persons belonging to the third gender. Dalit and tribal students are denied sufficient access to institutions of higher education, including hostels. They are subjected to humiliation based on their identities in the campuses. There is double discrimination in the case of Dalits in the form of decrease of quantum of funds along with every day discrimination faced by them due to their caste identity. When it comes to dalit female students, the intersection of caste and gender is an additional discrimination and aggravates the situation. In terms of reservation and benefits for OBC students. By denying reservation and scholarships to these marginalised groups, the learning system is being closed to these communities. It is outrageous that the educational funds and scholarships for the marginalised section is being used as a political tool to seek electoral gains. The geographical distribution of tribal population restricts their access to higher education severely. As the scholarship polices are being linked with new fiscal policies; it is very clear that the banking sector is now being encouraged to provide educational loans to students while they are being denied scholarships. These loans will not only make them enslaved financially but also become a bonded labourer for several years. Sexual harassment exists systematically in institutional spaces through discriminatory patriarchal practices and intimidatory tactics to reduce them from participating in political activities. Institutions have gender insensitive practices including the failure to understand the discrimination of queer and transgender. However, there is a spirit of ‘Rejection of victimhood’ among the dalit students.Although they are intimidated they have not given up and are fighting back. During the protests demanding extended hostel timings for girl students in a prominent Uttar Pradesh university, the Vice Chancellor reportedly said that “It is unnatural for girl students to study at night”. Breaking down on internal mechanism like Internal Complaints Committee and Sexual Harassment Committees has led students to seek extra institutional mechanisms like courts for redress. Women students are particularly targeted and intimidated, physically and sexually attacked during public protests, which is a patriarchal act by state agents. Kashmiri students and teachers are doubly stigmatised for being Muslim and Kashmiri.They are also often dubbed as ‘anti-nationals’, ‘Islamist terrorists’, ‘Pakistani agents’ etc. Systematic racist targeting of students from Northeastern states in public spaces are increasing and they also feel estranged due to their identity as tribals. The attacks and discrimination are primarily racist but have undercurrents of their religious and tribal identities. The content of knowledge is unfortunately from upper caste teachers in most of the colleges who are attached to majoritarian ideologies and hence classrooms become laboratories where the minds of young students are being moulded in a certain way.There is no diversity in the learning system. These trends unless addressed pose a profound danger to the very fabric of Indian democracy. Jawaharlal Nehru University, Delhi University, Jamia Milia University, Jadavpur University, Presidency University, Kolkata University, National University of Juridical Sciences Kolkata, Guwahati University, Tata Institute of Social Sciences Guwahati, Assam Women’s University Jorhat, Assam University Silchar, other colleges in Assam, Banaras Hindu University, Allahabad University, Lucknow University, Babasaheb Bhimrao Ambedkar Central University Lucknow, Aligarh Muslim University, other universities in Uttar Pradesh, Tata Institute of Social Sciences Mumbai, Film and Television Institute of India Pune, Indian Institute of Technology Mumbai, Mahatma Gandhi University Wardha, MS University Baroda, Central University Gujarat, Gujarat University, Indian Institute of Management Ahmedabad, National Law University Bhopal, Hyderabad Central University, English and Foreign Languages University Hyderabad, Osmania University Hyderabad, Madras University, Pondicherry University, Periyar University Salem, other universities in Tamil Nadu, Patna University, other universities in Bihar, Central University of Haryana, Punjab University, Vanasthali Vidyapith Rajasthan and a few others from Karnataka, Odisha and Jharkhand. Impact of privatisation and globalisation on education, distortion of history and syllabus and saffronisation of education, students unions and elections on campuses, criminalisation of dissent and, structural marginalisation in educational institutions based on caste, gender, religion and region.